In the spring of 2010 I visited a place called Kursi, which is located on the shores the shores of the Sea of Galilee in Israel. Kursi is famous for the swine miracle that Jesus did. According to an Israeli researcher, there is a Lemurian city in there in another dimension. In that city there is a light beam generator made from five crystals. The five crystals are arranged so that there is a large crystal in the middle pointing upwards and four other crystals arranged around it. 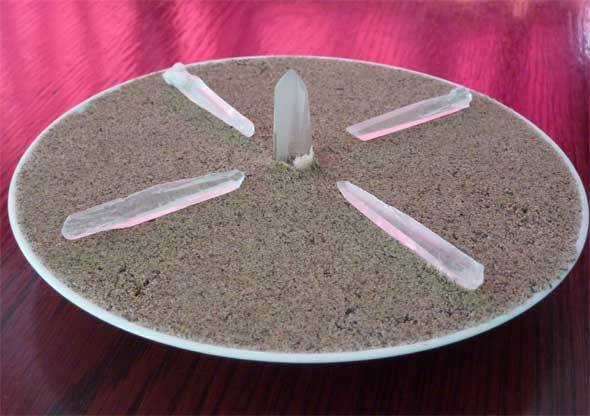 The four crystals have been programmed to collect energy from there surroundings and to feed that energy to the big crystal in the middle. The big middle crystal then collects that energy and creates a light beam that harmonizes the area. A few months ago I decided to try and copy the design of the kursi crystal device and build a smaller version for home use. The first device worked so well I began building devices for my friends from polyester. Unfortunately polyester turned out to be too poisonous to work with. So I simplified the design, and began using glass and sand instead.